Of late, there has been a surge of anthologies by Indian authors. And if I'm honest, it scares me. Simply because I am yet to read one that has made me go “oomph! - That was exceptional stuff!” Another thing that I find slightly worrisome is writing reviews for anthologies. I mean, how does one actually review an eclectic collection of short stories - all by different authors, and edited by a completely different person? That worry multiplies many folds when you actually “know” some of those authors and worse yet, you are actually good friends with them too. I could of course do the easy job and just not review it at all. But then again, where is the fun in that! I first heard about Mango Chutney when I chanced upon a meeting photograph on Facebook. (You've got to love social media for this - makes information flow so much easier). A couple of familiar names were included in that meeting and needless to say, my curiosity was piqued. So along with the rest of the blogging world, I too eagerly awaited this “Anthology of tasteful short fiction”, as the publishers put it. The book is flavourful - I’ll give it that. It is probably one of the better anthologies that I’ve read. The stories are broad and diverse, both in terms of locales as well as the plots. While some tug lightly at your heart-strings, some others successfully manage to keep your interest till the end of the story. But as with every mixed bag, there are a few stories that slightly missed the mark for me. No, they weren’t bad - but when placed side-by-side with some of the others, they ranked slightly lower. The Perfectly Poached Egg by Ramya Maddali - It is a simple story, which is different yet something that a lot of us who have ever tried to cook an egg would have encountered. This also provides a perfect example of where the narration and the attention to detail can improve an otherwise uncomplicated plot. The 37th Milestone by Abhishek Asthana - It is often difficult to pull off a short story which keeps you intrigued till the end. The 37th Milestone successfully does that, at least for me. Though the narration could have been slightly more detailed, it was an interesting read. The Birthday Boy by Harsha Pattnaik - It was one of the few stories that I had to re-read. It wasn’t because I couldn’t understand it - rather, I was compelled to read it again just to make sure I didn’t miss any part of it. The editor has mentioned in the acknowledgement section that Harsha Pattnaik is a 14-year old prodigy. And after reading The Birthday Boy, I would agree. Sawai by Arjun Bhatia - The story started of a tad too slow for my liking, but after the first page, it had my attention. A simple, yet moving tale of the protagonist Nand Lal from the village of Tilonia and the camaraderie he shares with his English teacher. A few others that I’d like to mention along with the above four are Tainted Red by Aathira Jim, The Girl Who Owned Castles by Giribala Joshi, The Proof of Birth by Urvashi Sarkar, On the Other Side by Sakshi Nanda, Someone with Character by Alka Gurha and Prem ki Chashni by Sudhanshu Shekhar Pathak (translated by Harsh Snehanshu). Before I got my hands on the book, there were two stories that I was extremely curious about - Vaman by Rohit Gore and Angels and Demons by Purba Ray. With Vaman, Rohit has managed to give a sci-fi twist to a story that a lot of us probably know a bit of. Was it successful? Personally, I think the concept was innovative and quite neatly done, though I’d have loved a bit more of a tighter narration. Purba Ray is someone I’ve known for a bit through the blogging world, and hence the reason for my interest. She is a well-known Twitter celeb and her wit and humour are simply exceptional. However I’ve never seen her write fiction (or it could be that I missed it) - all of these added to my curiosity. Purba’s story is one of the few in the anthology that has more than a handful of characters. What I loved was the fact that she managed to build up the characters well and the story was intriguing. The only bit that missed the mark for me was the narration and some of the dialogues. Having said that, it was definitely worth a read. In my world, any review for a book would not be complete without some feedback about the book itself. Budding Authors: It has given a good platform for a lot of budding talent - some of whom I would probably have never known if it hadn’t been for this book. The title: It is catchy and being someone who loves food, it will always remain my head. The cover: One of the things that I’ve noticed with Indian anthologies is that the book cover is often way too complex with illegible fonts and garish colours. 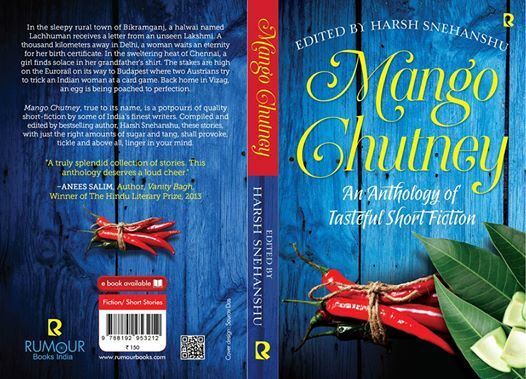 The cover for Mango Chutney is tastefully done. Errors: The First edition (I’m assuming what I have is the first edition) is peppered with errors - missing words, incorrect punctuation and spacing issues. Hopefully the subsequent versions should sort this part out. Language: I’m not sure if this is something for the authors or the editing team (or both). Some of the stories have way too many long sentences and far too many metaphorical references (almost every other sentence at times). While I understand that these add a certain level of ”literary complexity” to an otherwise simple plot, it may put off a few readers. My Verdict: The book is a one-time read. It does deliver a few tastefully tangy stories that both keep you intrigued and touch your heart - as promised. The opinions expressed in this review are mine. I have not been commissioned to do one.